It is important for an organization to constantly be → innovative to stay → competitive. Companies with a risk appetite build a higher productivity curve and ride the wave of innovation. 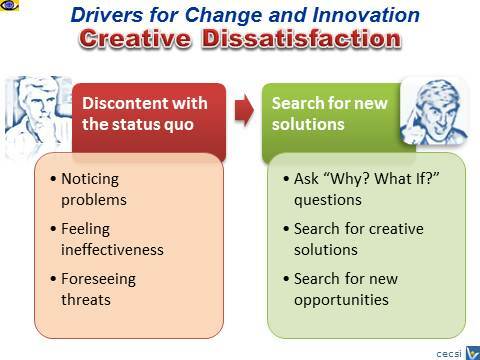 A culture of creative dissatisfaction in your organization will really help people to → constantly improve their performance and → innovativeness and also that of the entire company. >> builds → capacity for breakthrough innovations. 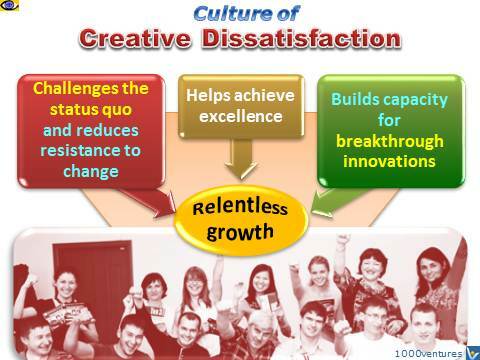 To establish a culture of creative dissatisfaction, you as a creative and → entrepreneurial leader must convey a burning desire to take the firm to the next level and make a big difference. Make people unhappy with the status quo. Stimulate innovative thinking, train people to think → creatively about → problem solving, improvement and innovation all of the time. Celebrate innovative efforts, including both successes and → noble failures.